New York Times bestselling author Robert K. Tanenbaum takes legal suspense to dramatic new heights—when his hero, District Attorney Butch Karp, goes up against a ruthless union leader with too much power, too many secrets, and too many enemies to silence . . . or kill. Prizefighter tough. Street-hustler smart. Pit-bull vicious. Longshoremen’s union leader Charlie Vitteli is like a cold-blooded villain straight out of Shakespeare’s Macbeth. Busting heads on the docks of New York as a brash union organizer, taking no prisoners as the newest president of the North Ameri­can Brotherhood of Stevedores, Vitteli clawed his way to the top of the heap—and no one’s going to take him down now. Not if they value their lives. Like Vince Carlotta. The union boss’s fiercest rival has accused Vitteli of embezzlement, election rigging, and other abuses—and even called him a crook at a union meeting. Now Carlotta is just another corpse on the waterfront—allegedly gunned down by an armed robber. It doesn’t take a genius to figure out that Vitteli is somehow involved. But proving it is a whole other story. Enter District Attorney Butch Karp and his wife, Marlene Ciampi. Drawn into the case by a friend who manages the East Village Women’s Shelter, Marlene speaks to the abused girlfriend of a man who may or may not have been hired to kill Carlotta. Marlene follows her lead to three different assassins contracted for the hit. But connecting them to Vitteli—and proving it in court—could be the death of anyone who tries . . . unless Karp can uncover the one tragic flaw that could bring down the curtain on this Shakespearean villain once and for all. 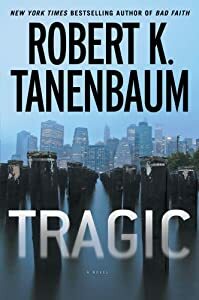 Packed with ingenious twists, diabolical turns, and shocking revelations, Tragic is Robert K. Tanenbaum at his page-turning best. This was a action packed suspense thriller that kept me on the edge of my seat from beginning to end. I found that for me this was a book that kept me entranced and I could not put it down. The author has also developed some great characters that the reader can relate to and I found that I wanted to read further to see what would happen next to these characters and to the overall plot of the story itself. You too will get lost in the story itself as well as in the action of the story. The book is non stop and will keep you guessing until the very end!